5/31 Cup of Coffee: Mike Shawaryn racked up the strikeouts again for the Drive, but a disastrous seventh inning put a dent in what had been an excellent night for the righty. Tyler Hill accomplished an impressive feat over the Drive's doubleheader. Steve Selsky came up with the eventual game-winning hit for Pawtucket. 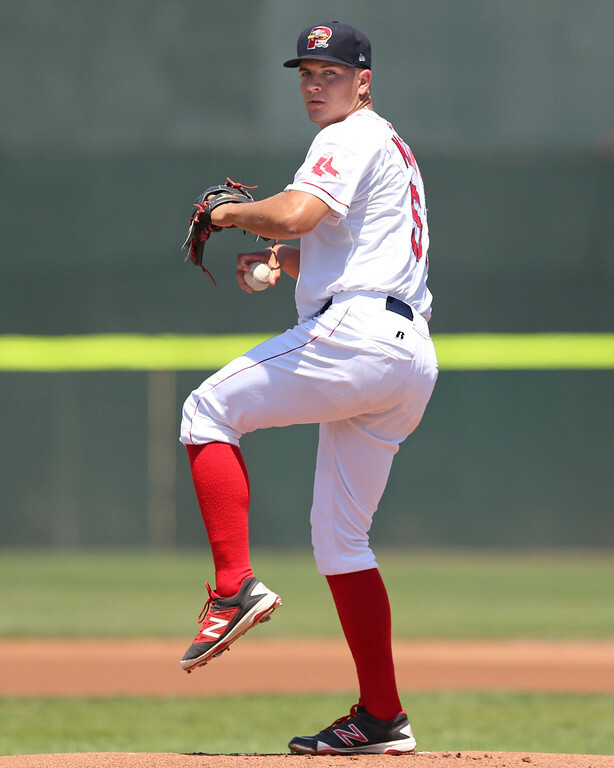 Jalen Beeks (pictured) took a no-decision for Portland, but posted a superb start. A three-run sixth put Pawtucket over the top on Tuesday, with Steve Selsky coming up with the go-ahead single. Playing at first base, Selsky went 2 for 4 with an RBI, a run scored and a stolen base. Rusney Castillo went 1 for 4 with a double, a run scored and a stolen base. 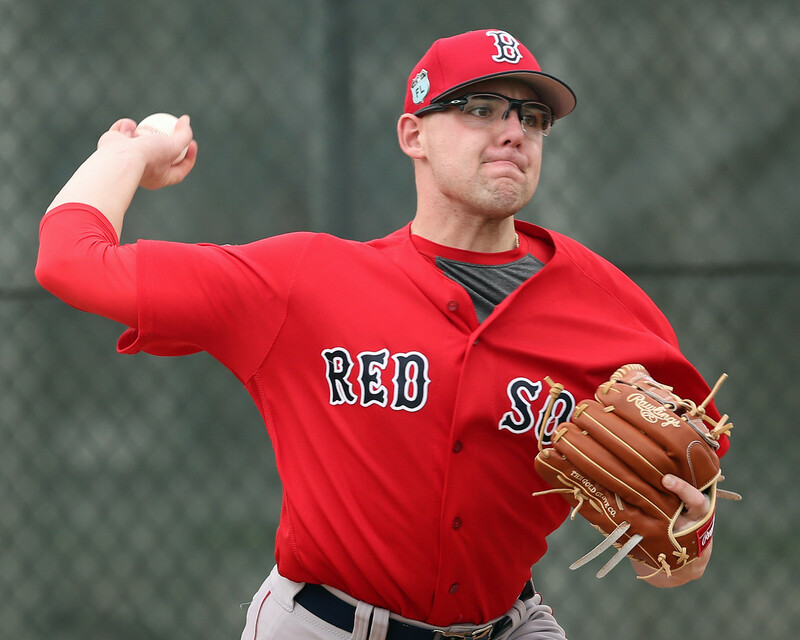 Marcus Walden earned the win, giving up just one run on four hits in five innings of work. He struck out three and walked none. 5/30 Cup of Coffee: The Red Sox got solid starting pitching from all four teams in action on the afternoon of Memorial Day. 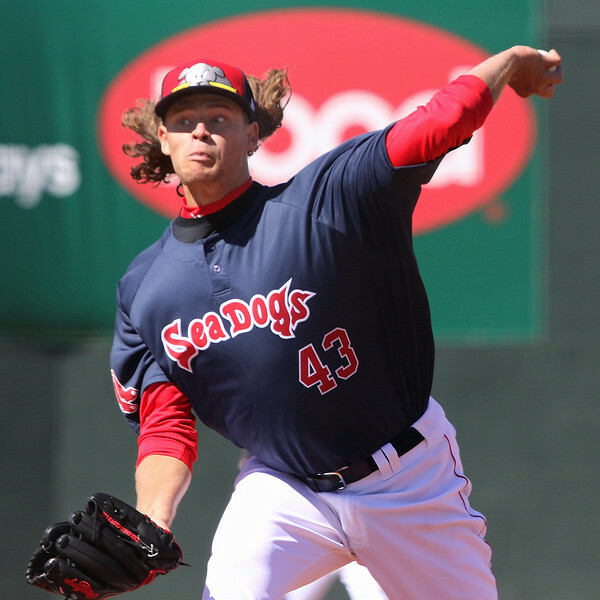 Coming into the day with an unsightly 15.00 ERA in two Portland starts, Travis Lakins (pictured) turned things around for the Sea Dogs. 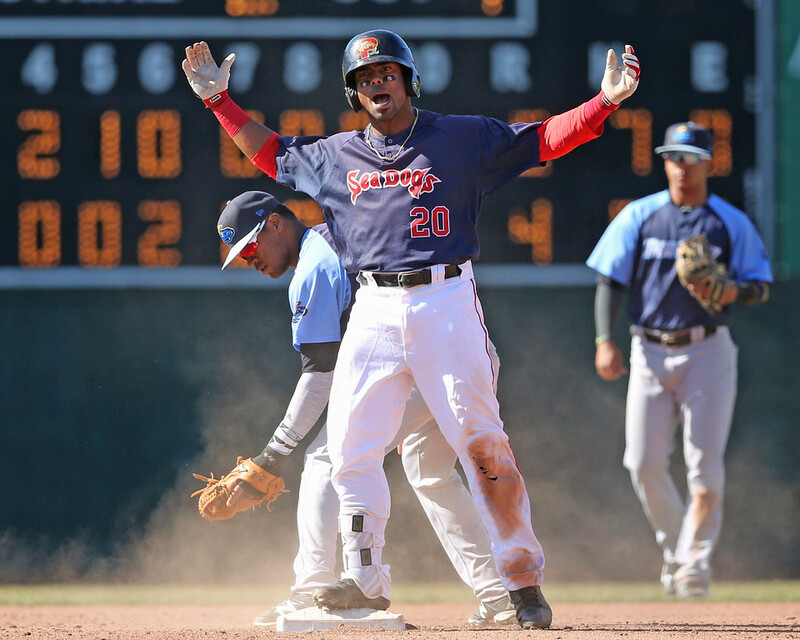 The PawSox completed a four-game sweep, while Salem avoided one. Greenville took the only loss on the day in extra innings as it kicked off its homestand. 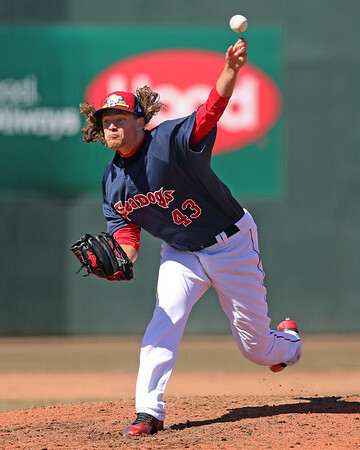 The PawSox completed a four-game sweep of the Bulls to close out their homestand. Shawn Haviland allowed just one run on five hits in six innings, striking out six. Brandon Workman returned to Pawtucket with two hitless innings of relief, and Noe Ramirez pitched the ninth for the save. Ryan Court had a big afternoon to lead the offense. The veteran utilityman got the start at shortstop and went 2 for 4 with a seventh-inning solo homer that gave the PawSox a 2-1 lead. Court has been a consistent performer of late, reaching base in all 14 games he has played in May. Blake Swihart played in consecutive games for the first time since returning from his finger injury and had his first double of the year. On Tuesday, the Red Sox called up SoxProspects.com's third-ranked prospect Sam Travis (pictured) to the show. Travis has only appeared in two games so far, making one start. He has two hits in five plate appearances, both singles. His first major league hit came in his second at-bat, a single off Martin Perez. In his Minor League Notebook from May 18, Alex Speier of the Boston Globe talks about Travis' hot streak in Triple-A. Travis said he was trying to do too much early on in the year and has gotten back to sticking with his approach. 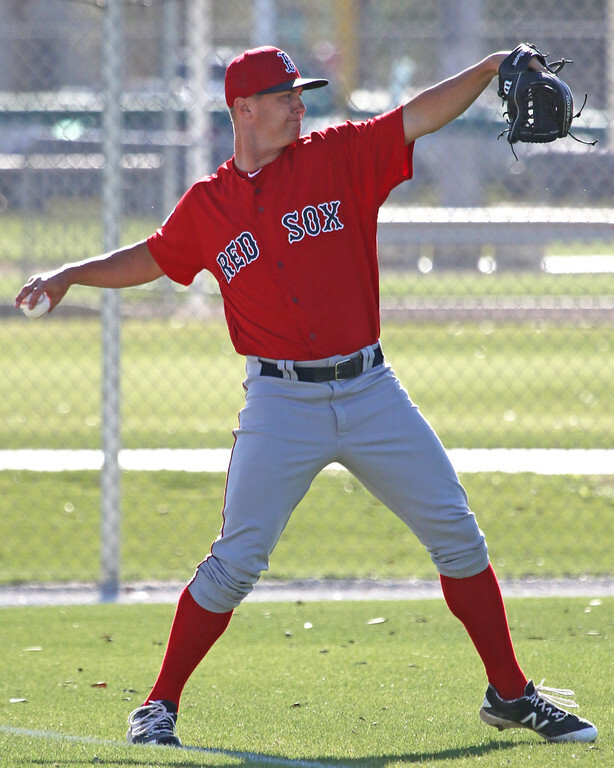 Speier also wrote about Keith Foulke and his expanded role within the organization. 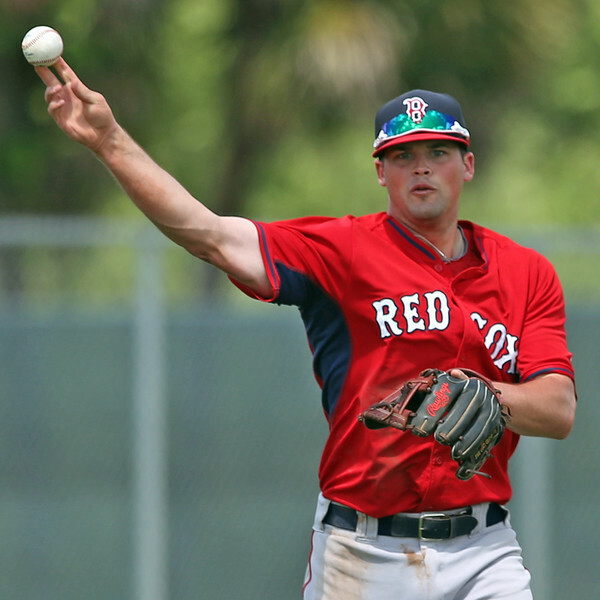 Foulke, who didn't pay much attention to baseball after he retired, is back and has been roving from team to team throughout the Red Sox minor league system. He works with relievers and helps them out by talking through situations with them. 5/29 Cup of Coffee: The affiliates earned a split on Sunday afternoon as the major league squad's five-game winning streak came to an end. Steve Selsky (pictured) and Rusney Castillo supported Henry Owens' solid effort, while Greenville mashed 12 hits in its blowout win. 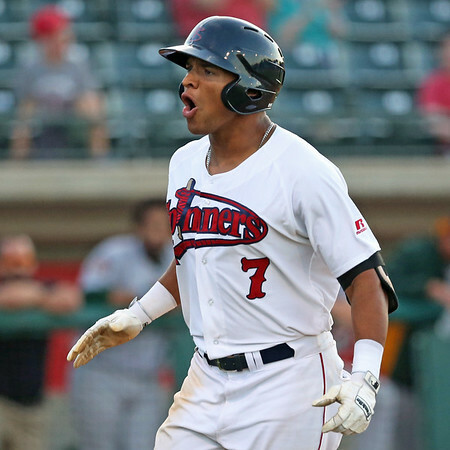 Rafael Devers went deep for Portland in a losing effort, and Salem fell just short in cobbling together a bullpen game. A monster afternoon from Steve Selsky helped the PawSox extend their winning streak to four games. Selsky blasted a grand slam in the first inning that gave Pawtucket a lead it would not relinquish and added some insurance with a solo blast in the third. He now has seven homers in 96 at-bats since being optioned to Pawtucket in late April. Rusney Castillo also went yard as part of a 3-for-4 afternoon. Henry Owens delivered what has become the typical performance for him. The left-hander was again tough to hit, as he struck out seven and allowed only four hits in giving up one run in his six innings of work, However, he again struggled with control and efficiency, walking four batters and needing 110 pitches to get through those six innings. 5/28 Cup of Coffee: Pawtucket was the only affiliate to win Saturday, as Bryce Brentz stayed hot with a home run. 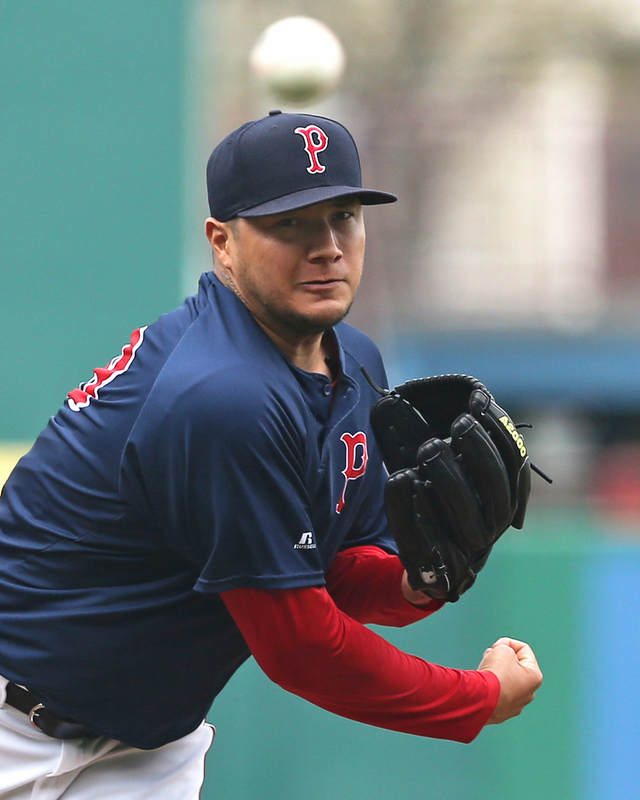 Hector Velazquez pitched seven strong innings in his first start back with Triple-A. Michael Chavis (pictured) and Josh Ockimey each went deep for Salem. After a rough outing in Oakland at the big-league level, Hector Velazquez bounced back nicely with seven innings of two-run ball. He struck out seven and walked only one. Jamie Callahan and Chandler Shepherd combined for two innings, three strikeouts, and no walks in relief. Steve Selsky and Bryce Brentz did most of the damage, with Selsky blasting a three-run shot and Brentz belting a two-run shot in a multi-hit effort. Pablo Sandoval was 0 for 3 with a walk in another rehab game. 5/27 Cup of Coffee: Three of the four games on Friday ended in walk-off fashion, with the PawSox being the only victorious one. Bryce Brentz (pictured) had a big night at the plate and capped it with a walk-off single. Bryan Mata made his Greenville debut and impressed. The PawSox bullpen saved the day after receiving seven solid frames from Kyle Kendrick. The righty allowed three earned runs while striking out five and walking none. Austin Maddox tossed three shutout innings in relief to lower his ERA to 1.23. Matt Dominguez homered and Bryce Brentz went 2 for 3 with three walks and the game-winning hit in the bottom of the 12th. Pablo Sandoval was 0 for 5 in a rehab game, but made some nice defensive plays. 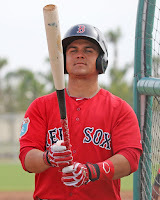 5/26 Cup of Coffee: If there have been two constants of the minor league season so far, they have been rainouts and Michael Chavis dominance. Thursday featured both. Chavis continued his torrid run at the plate, reaching base five times in Salem's doubleheader sweep. Meanwhile, Portland and Pawtucket were victims of weather, with both their contests getting rained out. Logan Boyd (pictured) led a trio of Greenville hurlers in a 1-0 shutout victory. The PawSox were rained out for the eighth time this season. The Bats do not return to McCoy Stadium this year, so if the game is made up it will be with Pawtucket playing a "home" game in Louisville during their trip there in mid-August. PAWTUCKET, R.I. -- David Price made his second rehab start on Wednesday evening at McCoy Stadium against Reds affiliate Louisville. Here’s The Write-Up on his start. Line: 3.2 IP, 7 H, 6 R/3 ER, 1 BB, 4 K; 89 pitches, 61 strikes (68%); 14/20 first-pitch strikes (70%); 9 swing-and-misses. The plan for David Price in this second rehab outing was to get in 85-90 pitches, ideally spread over five or six innings of work. Price instead ended up laboring through 3 2/3 innings to the line you see above. Going into a rehab outing like this, I’m not necessarily concerned with results. There were two criteria I was looking for to determine whether Price is ready to return to the majors: Sustained arm strength and command of his arsenal. Unfortunately, I saw neither. 5/25 Cup of Coffee: It's not quite the same pace as Chris Sale, but Mike Shawaryn continues to rack up the strikeouts in his full-season debut. The right-hander struck out 11 to help lead Greenville to victory after it fell in the opener of a doubleheader. Pawtucket lifted up David Price, who struggled in a rehab outing, with an 18-hit barrage. Portland got six shutout innings from its bullpen in a morning victory, while Salem's attempt to play a double-header was shortened by rain. Making his second rehab start, left-hander David Price allowed six runs (three earned) on seven hits in 3 2/3 innings. He struck out four and walked one, and 61 of his 89 pitches were thrown for strikes. The Pawtucket bullpen shut down Louisville after Price departed, with Marcus Walden, Kyle Martin, and Blaine Boyer combining for 5 1/3 scoreless innings of work. Every member of the Pawtucket lineup got at least one hit as part of a 13-run rampage. Pablo Sandoval, also on a rehab assignment, got the start at third base and was 2 for 4 with two doubles and a walk. Bryce Brentz doubled and homered, picking up his first extra-base hit since April 30. Steve Selsky and Brian Bogusevic also went deep, while Matt Dominguez tallied three hits. 5/23 Cup of Coffee: In an abbreviated schedule due to rainouts, Pawtucket and Portland both dropped their games. Allen Craig came off the bench to help out the PawSox. Travis Lakins (pictured) struggled again since his promotion to Double-A, taking a loss in game one of a doubleheader. Rafael Devers had a day to forget with an 0-for-8 performance over two games. Salem and Greenville were rained out. It was a frustrating night for the PawSox as they left 14 men on base. Allen Craig, who started the game with the night off, went 2 for 3 with a two-RBI double. He came into the game after Rusney Castillo was plunked in his right leg and was forced to exit. Shawn Haviland gave up four runs on six hits, striking out three and walking 2. 5/23 Cup of Coffee: It was a light slate on Monday with Pawtucket off and Portland postponed. Michael Chavis, Josh Ockimey (pictured), and the rest of Salem's offense came through in support of Roniel Raudes, and Greenville's bullpen kept the Drive in the game after a rocky start from Robby Sexton. The opening game of Portland's four-game set with the Fisher Cats was postponed due to unplayable field conditions. The game will be made up as part of a doubleheader on Tuesday at 5:35 p.m.
A late offensive outburst propelled Salem as they doubled up the Pelicans. It was the usual suspects doing damage, with Michael Chavis going 3 for 5 with two runs scored and two RBI. Chavis now has at least two hits in 11 of the 21 games he has played in May. Josh Ockimey launched a two-run home run, his fifth of the year, and Trenton Kemp went 2 for 5 to push his average up to .391. Chad De La Guerra continued to be an on-base machine, reaching base four times via a single and three walks as his on-base percentage rose to .415. There were a slew of roster moves the last few days, and Chris and Ian discussed them on the most recent episode of the SoxProspects Podcast. The guys also discussed some of the more notable players on the PawSox and also answered some mailbag questions. The roster moves were highlighted by David Price and Pablo Sandoval beginning rehab assignments in Pawtucket. Price allowed three runs in two innings in his first appearance, and he is scheduled to pitch again for the PawSox on Wednesday. Sandoval is 1 for 9 over his three games, and he has yet to record a walk or a strikeout. Podcast Ep. #119: I'm abusing nothing! 5/22 Cup of Coffee: Offense was scarce on Sunday, as each team in action tallied just one run. Portland was able to win with just one run, however, thanks to great pitching from starter Teddy Stankiewicz and Yankory Pimentel. 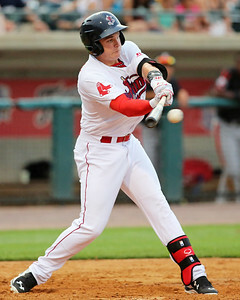 Brock Holt homered in another rehab game as well. Greenville's game was canceled due to inclement weather. 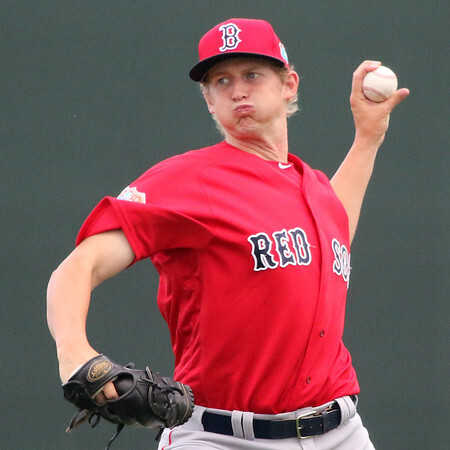 Henry Owens delivered a solid start in Buffalo by allowing just two earned runs in six innings, but it wasn't enough to overcome an anemic performance from the offense. He struck out seven and walked three. Blaine Boyer tossed two scoreless innings in relief with two strikeouts. In a rehab game, Brock Holt hit a solo home run as part of a 1-for-4 game. Steve Selsky added a double and Ryan Court reached twice with a single and a walk. Teddy Stankiewicz was brilliant, hurling seven shutout innings while allowing just five hits (all singles) and two walks. He lowered his season ERA to 3.24. Yankory Pimentel finished it off with two scoreless innings and two strikeouts. Nick Longhi drove in the lone run with a fourth-inning single that scored Tzu-Wei Lin, who singled and walked. 5/21 Cup of Coffee: It was another great night for Michael Chavis as he continues to battle with teammate Trenton Kemp to see who can put up more impressive offensive numbers. Brian Johnson pitched well for the PawSox, and Rusney Castillo went deep again. 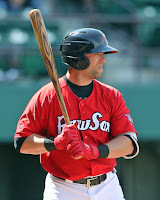 A double from Brian Bogusevic in the top of the ninth proved to be the difference as the PawSox outlasted the Bisons. Brian Johnson notched his fourth straight quality start, allowing three runs, two earned, over 7 2/3 innings. He walked two and struck out five while surrendering seven hits. His WHIP now sits at 1.34 and batters are hitting just .253 against him. Austin Maddox picked up his first Triple-A victory, throwing 1 1/3 scoreless innings. 5/20 Cup of Coffee: It was a lean night in the system, as Salem was the only team able to squeak out a win. David Price, Brock Holt, and Pablo Sandoval all made rehab starts in Pawtucket's extra innings loss. Portland failed to muster any offense behind a lackluster pitching performance. Salem stole the win on a 10th-inning, walk-off single after a three-run, ninth-inning rally. Greenville lost late after tying the game following Asheville's five-run first inning. It was an unorthodox game for the PawSox, as they started three rehabbing major leaguers, saw a position player come into pitch, and endured a 19-minute delay when the lights went out in the 11th inning. David Price took the ball for Pawtucket and lasted just two innings, surrendering three runs on five hits while striking out four. Starting second baseman Mike Miller was saddled with the loss after allowing a walk-off home run in the bottom of the 13th despite throwing two innings of scoreless relief. Miller also went 2 for 5 before being called upon to pitch. Pablo Sandoval, who is also on a rehab assignment, went 0 for 3 and Brock Holt went 1 for 4. Rusney Castillo was Pawtucket's lone offensive standout, as he went 3 for 7 with a double. Pawtucket made a stunning comeback to tie the contest in the ninth, but fell in extra innings. Down 10-5, Pawtucket rallied for a single run and then loaded the bases, setting the stage for a Matt Dominguez grand slam. The offense continues to revolve around a scorching-hot Sam Travis, who was 5 for 6 with two doubles, making him 11 for 19 in the four-game set. Kyle Kendrick struggled mightily in his return to Triple-A, surrendering seven runs in only three innings. Brandon Workman got back on track after a pair of shaky outings, striking out five in 2 2/3 scoreless innings. The Pawtucket Red Sox and the city of Pawtucket have agreed on a proposal that would keep the PawSox in Pawtucket until 2050. They would commit $45 million toward "A Ballpark at Slater Mill." Overall, the PawSox would pay about 54% of the combined ballpark and land costs. Kate Bramson of the Providence Journal has more, as House Speaker Nicholas Mattiello says that a legislative package that involves state financing of a new stadium must come with the governor's approval. 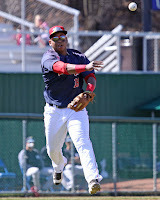 Portland third baseman Rafael Devers (pictured) continues to mash, as he's now batting .330/.398/.591 on the season. Craig Forde of MiLB.com writes about how Devers' first half slump in 2016 turned out to be a positive for him. 5/18 Cup of Coffee: It was a rough night on the mound for the affiliates, with every starter struggling to varying degrees. 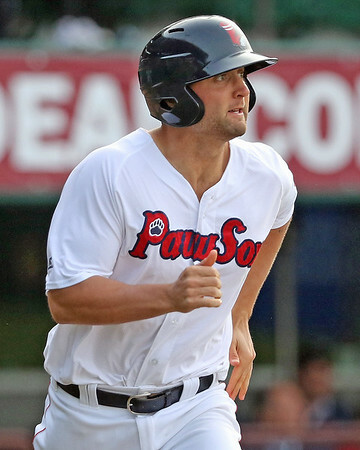 Pawtucket and Portland had good offensive showings, with Sam Travis (pictured) and Rusney Castillo homering for the PawSox and Josh Tobias driving in three runs for Portland. 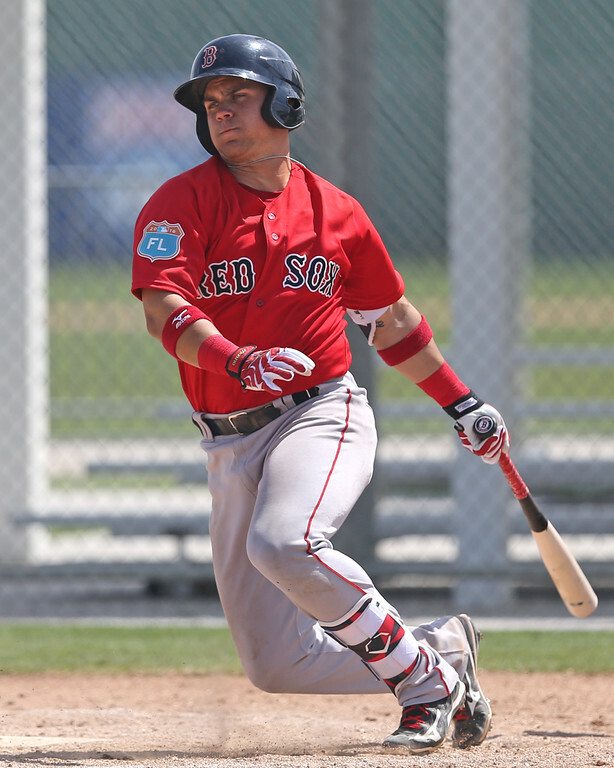 Michael Chavis stayed hot for Salem, while Roniel Raudes was roughed up again. The RailRiders rallied for three runs in the eighth to beat the PawSox. A three-run home run by Sam Travis and a two-run home run by Rusney Castillo kept Pawtucket in the game, but the bullpen could not hold the lead. Travis now has two hits in six of his last nine games, and he homered for the second straight night. Castillo went 2 for 5 with a double and his fourth home run of the year, after entering the game in a 3-for-26 slump. Shawn Haviland allowed six runs on 11 hits over six innings, and Noe Ramirez allowed a two-run home run in the bottom of the eighth that proved to be the difference in the game. Pawtucket had the tying run at third in the top of the ninth, but Travis and Steve Selsky struck out to end it. Ahead of his major league debut on Thursday night, we've updated Hector Velazquez's scouting report, the first of many updates coming over the next week or so. 5/17 Cup of Coffee: Sam Travis clobbered his third home run on the season in a Pawtucket loss. 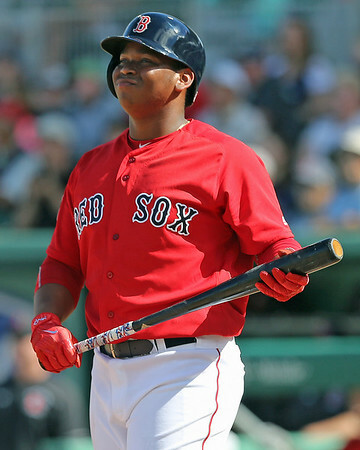 Rafael Devers (pictured) was at it again for Portland, with another multi-extra-base-hit performance. Tate Matheny and Michael Chavis led a 13-hit Salem attack, but the High-A affiliate still fell. Greenville lost in dramatic fashion, but not before Tyler Hill had yet another big night at the plate. For the second straight outing, Henry Owens struggled mightily with his command and was roughed up. Owens walked a whopping seven batters in 4 2/3 innings of work. He allowed five runs on six hits, but did also strike out five. Sam Travis was the brightest spot for the Pawtucket offense on Tuesday, going 2 for 4 with a solo home run in the eighth inning. 5/16 Cup of Coffee: A three-run homer off the bat of Tyler Hill to lead a come-from-behind win for Greenville was the highlight on Monday night. The Drive won their third straight as they continue to open their lead in the South Atlantic League Southern Division. 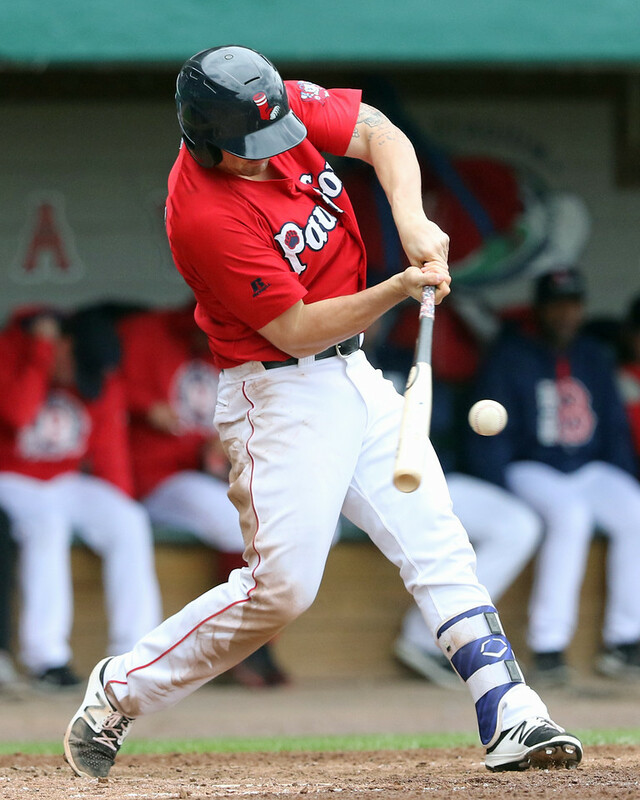 After leading 4-3 in the bottom of the ninth, the PawSox ended up falling on a walk-off, 12th-inning grand slam, and Salem squandered its shot by going 1 for 17 with runners in scoring position. It was a tough night for the PawSox, who allowed a home run to the first batter they faced and the last batter they faced and also failed to hold a ninth-inning lead in between. Brian Johnson, a candidate to start in the majors this weekend if Drew Pomeranz needs to miss a start, allowed a lead-off homer but settled in after that, giving up three runs on seven hits in 6 1/3. Several hours later, Brandon Workman entered in an unenviable situation. With two on and one out in the bottom of the twelfth, Workman surrendered a single followed by a walk-off grand slam. Steve Selsky homered for the third time this season, and Sam Travis added a pair of hits. The worst news of the evening came in the fifth inning when rehabbing third baseman Brock Holt had to leave the game due to a recurrence of vertigo symptoms. 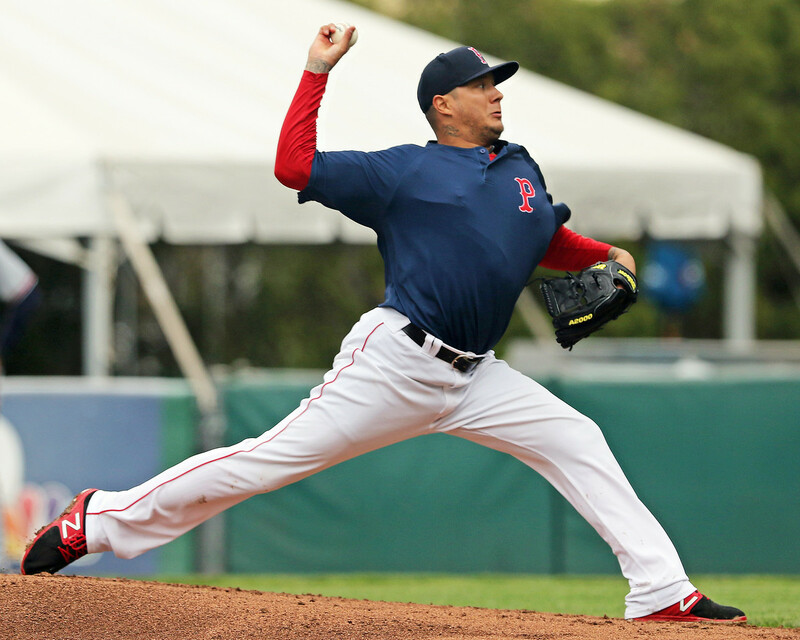 In case you missed it, earlier last week SoxProspects.com Director of Scouting Ian Cundall released his latest Scouting Scratch, covering Pawtucket right-hander Hector Velazquez (pictured, right). The Red Sox will need a starter this Saturday to fill the gap until David Price is ready to return and also possibly Friday depending on the Drew Pomeranz injury. Speculation has been that Velazquez could get the call due to his very strong performance thus far. Count Mass Live's Jen McCarthy among those who think he merits consideration for the fifth spot in the rotation. Velazquez had a strong start to open the week last week, throwing 6 1/3 shutout innings, and added a second strong start over the weekend going 7 innings while only allowing 2 earned runs. Overall, that runs his totals to 29 innings pitched with a 1.86 ERA, 0.79 WHIP, and 20 strikeouts with 5 walks. He has continued to ramp up his performance, going deeper into each game thus far in his first five games. 5/15 Cup of Coffee: Pitching largely stole the show on Sunday, as all three active affiliates received relatively strong starts from their pitchers. Portland took the tough-luck loss in a pitchers' duel and Salem was victorious behind a valiant effort from a recent convert. Strong pitching in Greenville took a backseat, as the offense exploded in a 12-run, 14-hit attack. Pawtucket was rained out at home and will make up the contest as part of a doubleheader on June 17. David Price had been scheduled to make his first rehab start, but instead threw 75 pitches in a simulated game. The Sea Dogs came out on the losing end of a pitchers' duel, as Kevin McAvoy (pictured) went seven innings, allowing just one run (a home run in the first) on seven hits while striking out six. Ty Buttrey took the loss, as he surrendered the winning run in the bottom half of the eighth. The offense sputtered behind the strong pitching mustering only two hits on the day, though Rafael Devers broke up the Phils' no-hit bid in the seventh and tied the game with his seventh long ball of the year. 5/14 Cup of Coffee: On a light night for the system, Salem got a solid pitching performance from Dedgar Jimenez and Pawtucket saw another quality start from Hector Velazquez. Ryan Scott provided the pop for Greenville in a tight win. The PawSox could only muster three hits and were held hitless through the first 6 1/3 in Saturday's loss. Hector Velazquez was the tough-luck loser, posting his third straight quality start. The 28-year-old righty went seven innings, allowing two runs on seven hits, striking out three and walking none. His ERA through five starts sits at 1.55. Ryan Court provided Pawtucket's lone run with a solo shot in the eighth. 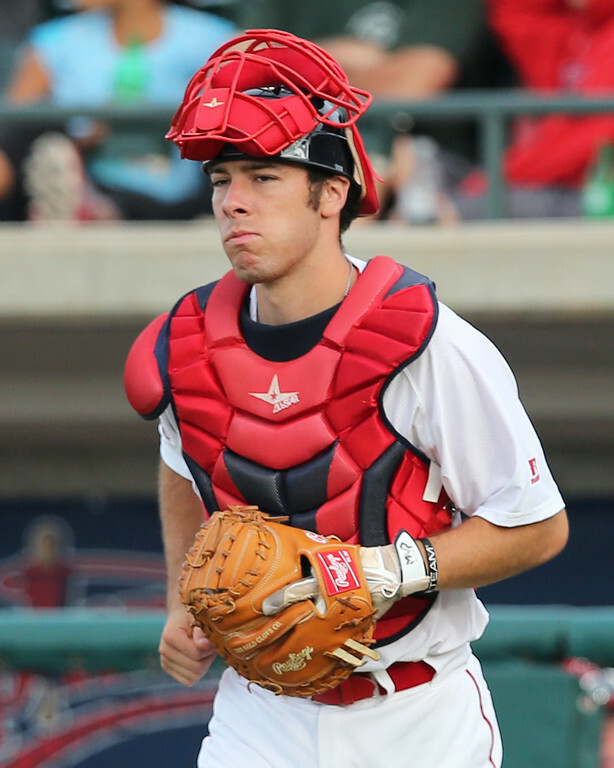 Brock Holt went 0 for 4 in another rehab start at third base. Pawtucket brought the winning run to the plate in the ninth, but Court struck out to end the game. 5/13 Cup of Coffee: There wasn't a ton of offense last night, as all three affiliates that were in action took losses. 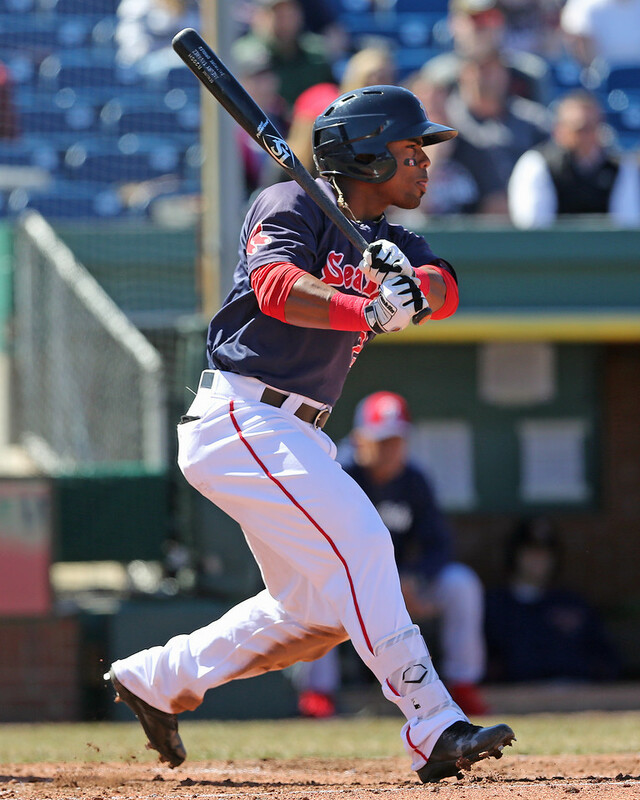 Josh Tobias continued to swing a hot stick and Rafael Devers picked up a pair of hits. 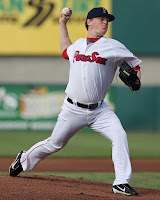 Mike Shawaryn put together another very nice outing and Jamie Callahan pitched well in his Triple-A debut. Shawn Haviland (pictured) pitched well in the loss, going six innings and allowing just one run on three hits. He struck out four and walked one. Jamie Callahan made his first Triple-A appearance and tossed a scoreless inning with one strikeout and one walk. 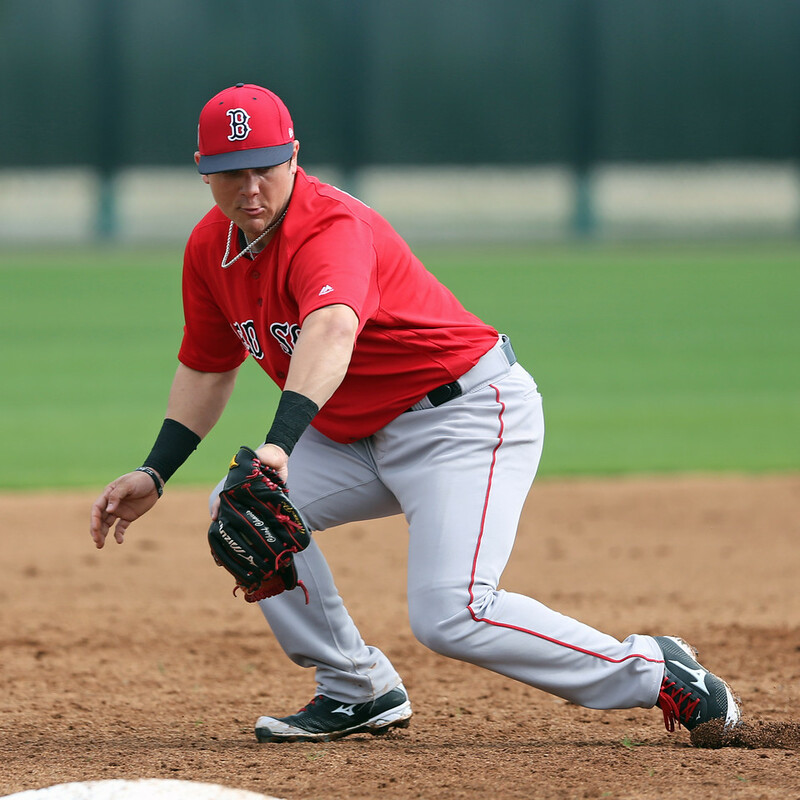 Rusney Castillo, Brock Holt, and Dan Butler each collected two hits. Holt is still on a rehab assignment and also made a terrific play at third base. 5/12 Cup of Coffee: Michael Chavis (pictured) led a barrage at Buies Creek, as the third baseman had two more doubles as part of Salem's 16-hit rampage. Jalen Beeks and Ty Buttrey continued to stymie Eastern League opponents, pitching in for a shutout, while the PawSox dropped a heartbreaker in the ninth. It was an inopportune time for Brandon Workman to allow his first runs of the season, as the right-hander gave up a pair in the ninth inning to take the loss. Workman entered with 12 1/3 scoreless innings between his Triple-A and major league time, but he gave up the two runs on three hits and a walk in 1 2/3. Mike Miller blasted his first home run of the year, and Sam Travis picked up a pair of hits. 5/11 Cup of Coffee: It was a rough night offensively for the affiliates as the four teams combined to score 14 runs. Lorenzo Cedrola's two hits were the only thing stopping Greenville from being no-hit, while every starter for Salem struck out at least once. 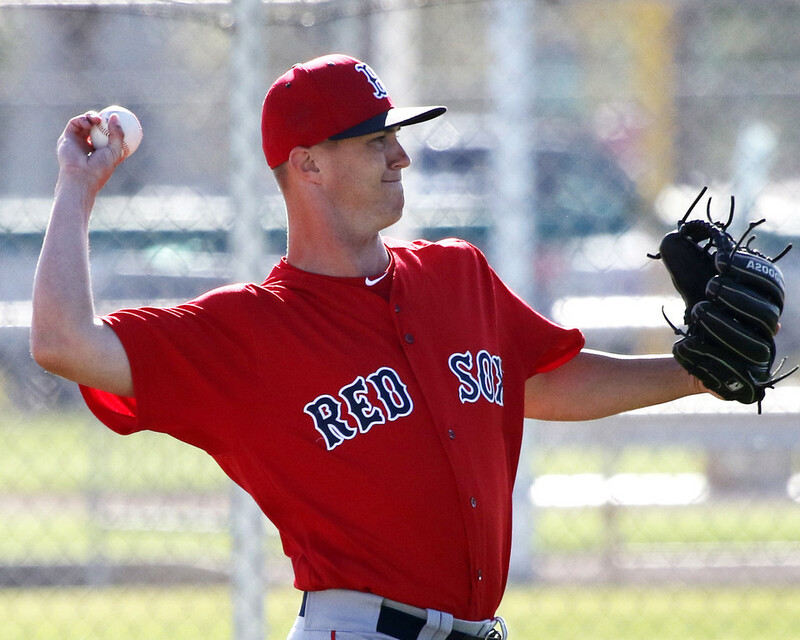 Henry Owens and Jake Cosart both continued to have varying degrees of control issues, while Sam Travis and Nick Longhi kept on swinging the bat well. Matt Kent was the only starter to have success, as he improved to 2-2 on the year. 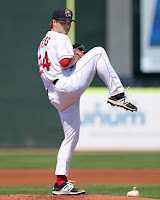 Henry Owens continued to struggle with his control, walking three over five innings, as he took the loss on Wednesday. Despite the high walk totals, Owens entered the game with an ERA of 1.35 and a batting average against of .175, but the RailRiders were able to get to him for four runs on six hits, with one of the hits being a two-run home run. Robbie Ross Jr. struck out three and walked one in his only inning of work. The offense was led by Sam Travis who went 2 for 4 with a walk and collected his fourth double over his last five games. His batting average has moved up to .253 after starting the season 5 for 36. Tim Roberson also added two hits, while Jantzen Witte went 1 for 3 with two walks. Another rough start for Jacob Dahlstrand doomed the Sea Dogs as they could not hold an early lead. A week after not being able to make it out of the first inning, Dahlstrand allowed five runs on eight hits over 3 1/3 innings. Taylor Grover pitched well in long relief as he did not allow a run over 3 2/3 innings, and Jake Cosart walked three and allowed one run over one inning. Cosart now has 21 walks in only 9 1/3 innings. 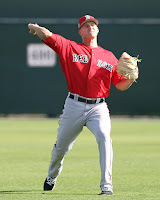 SoxProspects.com sources have confirmed that right-handed pitcher Travis Lakins has been promoted to Double-A Portland. Lakins, currently the seventh-ranked prospect in the SoxProspects rankings, has been off to a phenomenal start to the 2017 season in his return to High A Salem. In seven starts, the 22-year-old is 5-0 with a 2.61 ERA, allowing 13 walks while striking out 43 in 38 innings. Lakins has been consistently excellent this season, allowing two or fewer runs in all but one of his seven starts. In his final start for Salem on Tuesday night, Lakins earned the win after allowing one run in 6 2/3 innings on 2 hits and 4 walks while striking out 8 hitters. 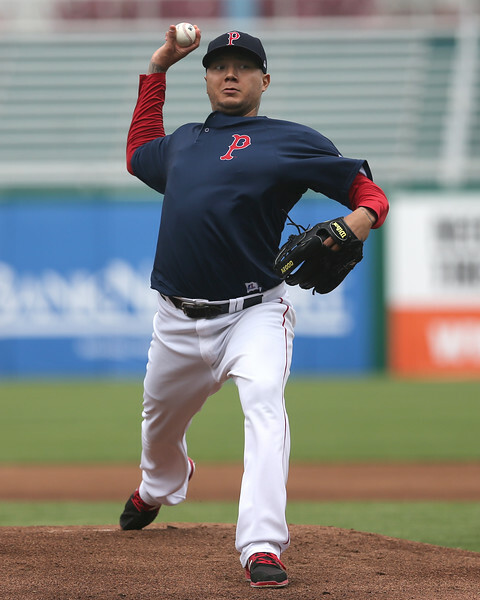 PAWTUCKET, R.I. -- Although the Red Sox were banned from signing amateur international free agents during the 2016-2017 international period, they were still able to sign professional international players, and in February, the club signed right-handed pitcher Hector Velazquez from Campeche of the Mexican League. I got my first look at him on Monday night against Scranton (NYY), and here is my Scouting Scratch. Line: 6.1 IP, 3 H, 0 R, 2 BB, 1 HBP, 4 K; 92 pitches, 60 strikes (65%); 12/23 first-pitch strikes (52%); 6 swing-and-misses. The 28-year-old Velazquez had a breakout season in 2016 pitching for Monclova (on loan from Campeche), throwing 131.1 innings of 2.47 ERA ball with 120 strikeouts and only 16 walks. Between the Mexican League last summer and the Mexican Pacific League during the winter, Velazquez threw 246 2/3 combined innings in 2017. As a result, the organization has been carefully managing Velazquez’s workload. He started the season on a pitch count, but in his most recent start he topped 90 pitches and showed off an intriguing pitch mix that could put him in contention for a major league start should the Red Sox continue to struggle with injuries and performance from their fifth starters. 5/10 Cup of Coffee: Pawtucket was held to just three hits, but they made them count, as a rehabbing Brock Holt helped the Sox out. The Sea Dogs clawed their way back with a late rally, capped by a clutch hit by Josh Tobias. Salem cruised to a win on the back of another solid outing from Travis Lakins (pictured). Despite being held to three hits all night, two of those hits for Pawtucket were two-run home runs courtesy of Brock Holt and Matt Dominguez to give the Sox all the offense they would need. Brian Johnson somehow worked his way around 10 hits and two walks to earn the win in seven innings of work. Johnson was able to bear down when it mattered, keeping Scranton 3 for 11 with runners in scoring position. 5/9 Cup of Coffee: Monday was strong pitching performances across the organization, highlighted by a third consecutive scoreless outing from Pawtucket right-hander Hector Velazquez (pictured). Darwinzon Hernandez was perfect into the fifth inning in Greenville's win, while Kevin McAvoy got no support while turning in the strongest appearance of the three. Hector Velazquez last surrendered an earned run in the fifth inning of his stateside debut as a professional, back on April 11. He has since gone 17 1/3 innings, spreading seven hits. On Monday he gave up three hits and walked two in 6 1/3. Brandon Workman and Blaine Boyer finished off the shutout with 1 1/3 innings apiece. Sam Travis led the offense, delivering his second homer of the year along with a double. Travis has now doubled in three consecutive games after undergoing a 12-game stretch without recording an extra-base hit. UPDATE: There was a technical error the first time we uploaded the podcast that cut the last 5-10 minutes from the end of the episode. This has now been fixed. Sorry about that! The partners in crime, Chris and Ian, have the SoxProspects virtual podcast studio all to themselves. They break down the decision to hold off on rushing Rafael Devers to Boston. They go over why it's Kyle Kendrick and not Brian Johnson or Henry Owens replacing Steven Wright. Plus an in-depth overview of the 2-8 scouting scale, how options work and some speculation on why so many pitchers in the system are mowing guys down. Plus, it's mailbag emptying time. 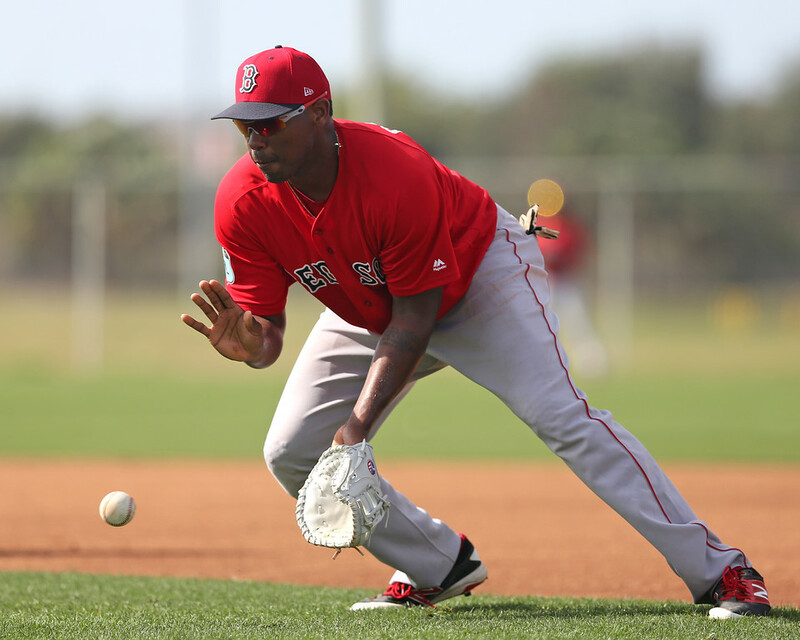 Minor Notes: Hit the gas or pump the brakes on Devers? The latest edition of the SoxProspects podcast dropped and Chris and Ian dove right into the hot topic in the farm system these days: should the Red Sox rush Rafael Devers (pictured, right) to the majors now that he's on a hot streak? They also talk about the decision to leave Brian Johnson at Triple-A, break down the 2-8 rating system for prospects and much more. Check it out! Director of Scouting Ian Cundall also wrote up his latest Scouting Scratch, taking a closer look at Portland's infield and a few more of their pitchers. He includes reports on Nick Longhi, Tzu-Wei Lin, Jalen Beeks, Ty Buttrey and Jake Cosart. 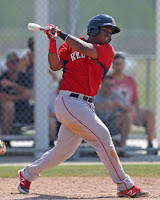 The first in a flurry of Rafael Devers-related news after his huge week at the plate, Alex Speier of The Boston Globe wondered if the 20-year-old Dominican could be the answer for the club's current woes at third base. One National League scout told Speier that Devers will be a star - "it's just a matter of when." 5/7 Cup of Coffee: Several Red Sox affiliates received dominant pitching performances on Saturday. Mike Shawaryn (pictured) struck out 12 in six innings for Greenville and Jalen Beeks tossed five shutout innings in the first game of Portland's doubleheader. 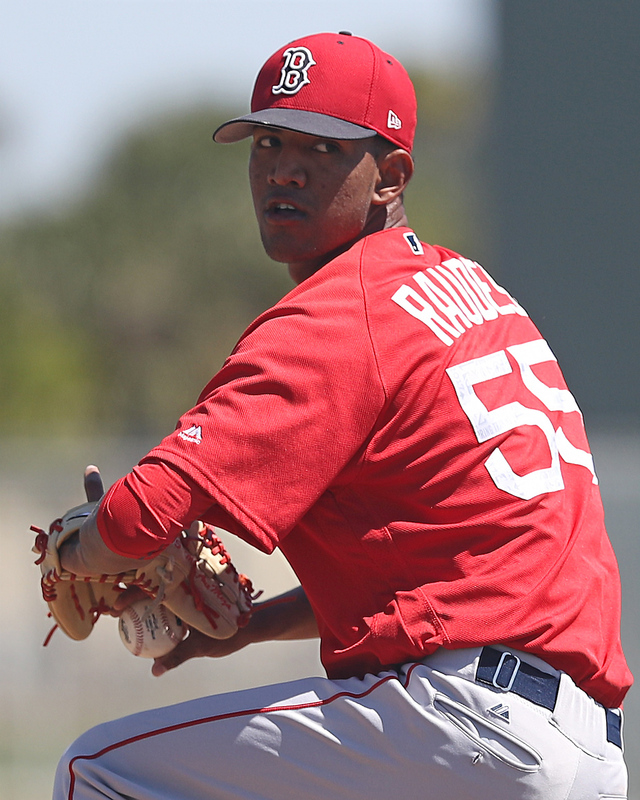 Roniel Raudes also threw five scoreless innings for Salem, though he walked four. 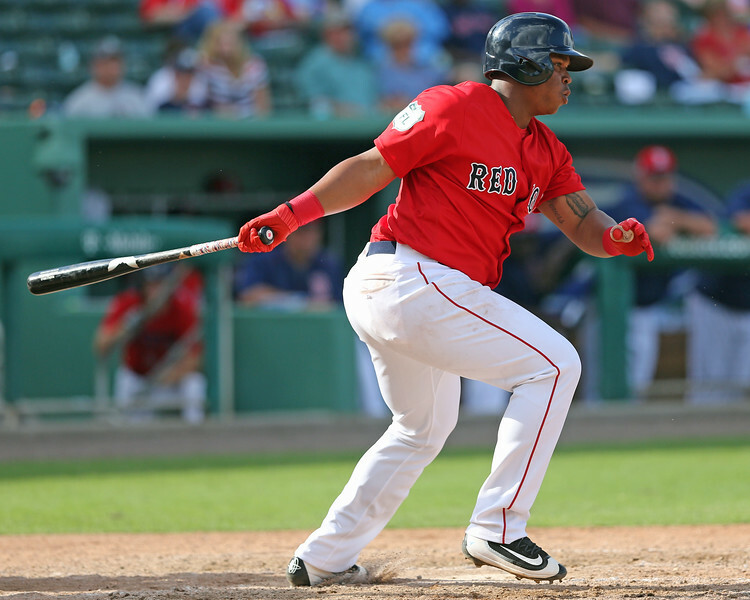 Rafael Devers cracked a grand slam as part of a 1-for-5 day for the Sea Dogs. 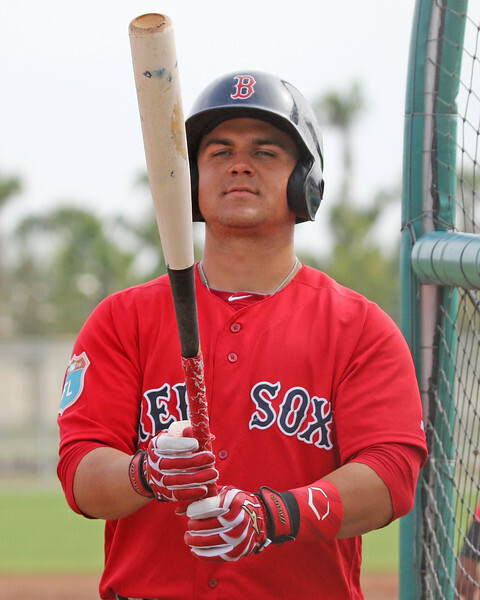 Michael Chavis reached base five times and hit a homer in a Salem doubleheader. Sunday's game in Rochester was postponed due to rain. The PawSox and Red Wings will make up the game as part of a doubleheader on July 5. The Sea Dogs rode a five-run third inning to a shutout win at Hadlock Field. Rafael Devers capped the inning with a grand slam, his fourth home run in May. He has adjusted well to Double-A and is now slashing .325/.364/.602 with six homers. 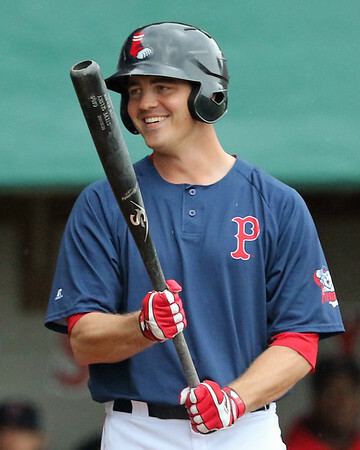 Brock Holt, in Portland on a rehab assignment, was 1 for 3 as the designated hitter. Jalen Beeks threw five dominant innings, striking out eight while allowing two hits and two walks. Ty Buttrey tossed two shutout innings of relief, fanning two. 5/6 Cup of Coffee: The bats were cooking last night, as Pawtucket, Salem, and Greenville combined to score 35 runs. 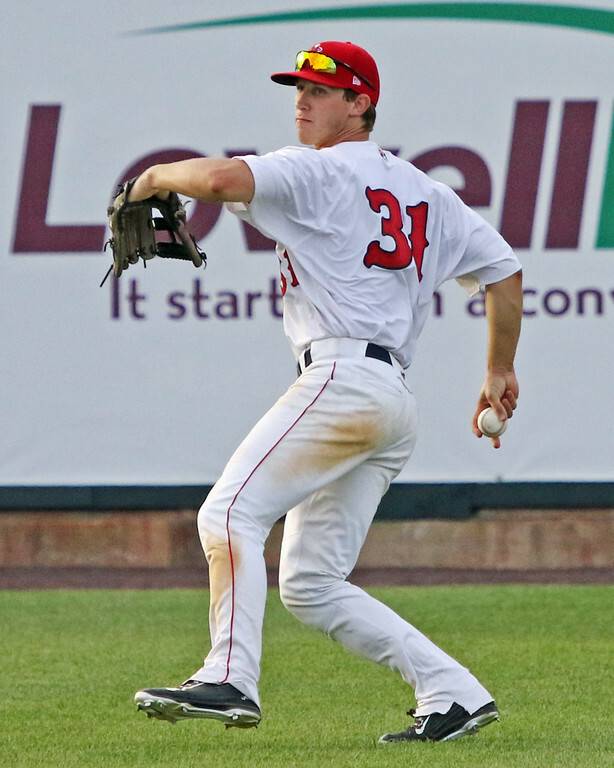 Rusney Castillo and Steve Selsky had big nights for Pawtucket, while Jordan Betts (pictured) and Roldani Baldwin had nice nights for Salem and Greenville, respectively. Marcus Walden and Shaun Anderson mixed in solid starts as well. After being the only team in the system to play two nights ago, Portland had both ends of a doubleheader rained out. A scoreless six innings from Marcus Walden and a pair of three-run frames for the offense set the tone for Pawtucket. Walden allowed just a hit and a walk while striking out four. Steve Selsky went 2 for 5 with two doubles and three RBI, and Rusney Castillo had three hits including a double. Sam Travis was 1 for 4 with an RBI ground-rule double. Over the first few weeks of the season, I’ve had a chance to see five Portland games and get an extended look at most of the team. Here is the final Scouting Scratch on Portland's infielders and another look at a few pitchers. 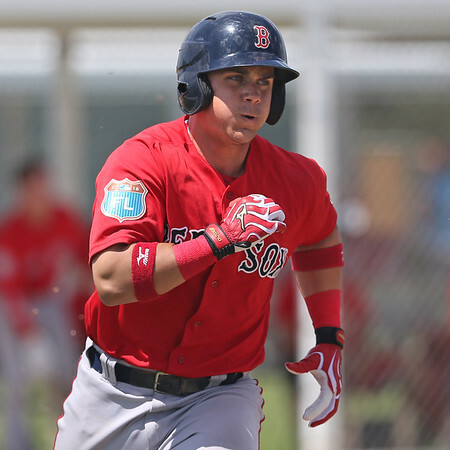 Nick Longhi began the season in the site’s top 10, but while he hasn’t come out as hot as newly minted top prospect Rafael Devers has, he still has shown some interesting tools as he adjusts to his new swing. Longhi used to utilize a toe tap and a swing tailored to hard contact gap-to-gap. This led to impressive extra-base hit totals (45 last year in Salem), but hadn’t translated to over-the-fence power with only ten home runs in 1,194 plate appearances entering 2017. This offseason, Longhi changed things up and now is using a leg lift and an altered swing path more tailored to hit the ball in the air. Though the average hasn’t been there, Longhi has already matched his 2016 home run total with two. The second home run came in game one of the April 22 doubleheader against Trenton. Longhi got an 0-1, 93-mph fastball down and in. Longhi pulled has hands in and cleared his hips, golfing the ball out 410 feet, long over the left field wall, with an exit velocity of 110 mph. 5/5 Shot of Espresso: This morning's Cup of Coffee will be a brief affair, as Mother Nature interfered in three of the four scheduled contests. The most surprising turn of events is that Portland was the game that was safe from her wrath, as the Sea Dogs prevailed in their contest. The least surprising was that Rafael Devers (pictured, right) got another two hits to help lead the effort. Syracuse, New York got 134.9 inches of snow this year, but apparently could not handle playing baseball through intermittent light rain. They'll play a doubleheader on June 13. 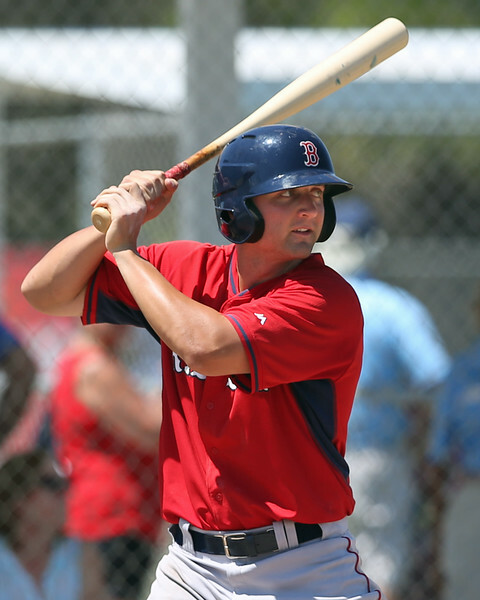 With so much of the talent in the Red Sox minor league organization having graduated from prospect status or getting traded over the past 18 months, there is a huge opportunity for talented players to establish themselves. Boston's last two third-round draft picks were standouts this April. 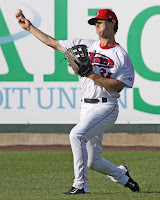 Catcher Austin Rei (pictured) ripped 10 doubles and posted a 1.003 OPS for Salem, and Greenville right-hander Shaun Anderson posted a 1.30 ERA while leading the affiliates in innings pitched. The April power surge was a departure for the 23-year-old Rei, who registered only 20 extra-base hits and a .318 slugging percentage in all of 2016 while a member of Greenville. The 2015 draftee battered Carolina League pitchers to the tune of .333/.429/.574, annihilating his .212/.331/.318 from the previous year. That number was made all the more impressive by him doing so while handling catching duties. His power surge came while maintaining excellent contact rates, striking out only seven times in 63 plate appearances. 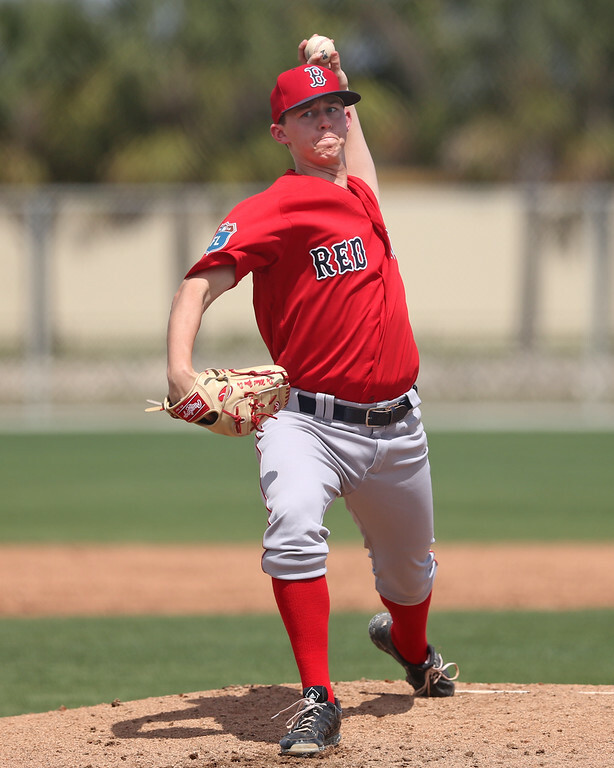 Part two of our big early May updates features five members of the Salem Red Sox pitching staff, led by young right-hander Roniel Raudes, and Portland Sea Dogs relief pitcher Jake Cosart. Expect more updates coming soon from early-season scouting! 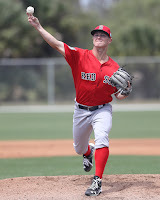 After some time off to focus on the System Restart and other projects, we're back in the swing of updating the scouting reports, with TEN updates published today based on scouting from Lowell in 2016 and this year's spring training. Among the updates are the injured CJ Chatham and a host of members of the Greenville Drive, including Tyler Hill, Yoan Aybar, and the club's newest player as of today, Jagger Rusconi. 5/3 Cup of Coffee: Rafael Devers stole the show on Tuesday night with possibly his finest performance of his young career, carrying the Sea Dogs in a wild slugfest. While some speculated that Brian Johnson would replace the injured Stephen Wright in Boston's rotation, the lefty instead remained in Pawtucket and dominated on the mound. 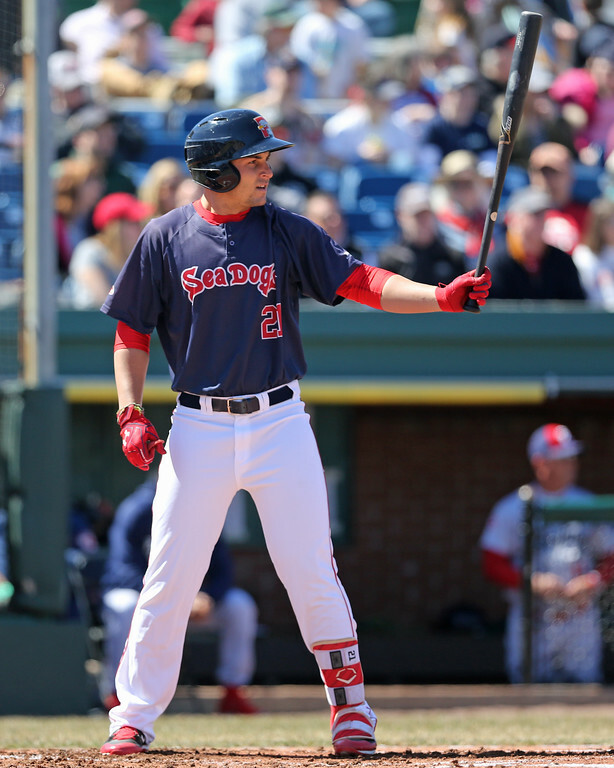 Michael Chavis once again added to his RBI total, but Salem was shelled in a loss. If Brian Johnson was upset he didn't get the call back to Boston, it didn't show, as the lefty dominated through eight innings to earn the win. Johnson allowed one run on just a pair of hits, while walking two and striking out six on an even 100 pitches. Aneury Tavarez made his 2017 Triple-A debut leading off for the PawSox and did not disappoint. The 25-year-old Dominican went 2 for 4 with a pair of doubles and an RBI. Steve Selsky clubbed a solo shot for his first home run of the season, going 2 for 4. Over the first few weeks of the season, I’ve had a chance to see five Portland games and get an extended look at most of the position players. Here is my Scouting Scratch on Portland's outfielders. After a strong 2016 campaign with Portland and a solid winter playing in his native Dominican Republic, outfielder Aneury Tavarez was selected by the Orioles in last December’s Rule 5 Draft. Unable to make the already crowded Orioles outfield, Tavarez was returned to the Red Sox, and somewhat surprisingly was assigned to Portland once again to start the season. Through 14 games, he has done nothing but hit, showing he is more than ready for a promotion to Triple-A, slashing .377/.473/.475 in 74 plate appearances (Tavarez was in fact promoted to Pawtucket on Monday, May 1st). Over the course of the five games I scouted, Tavarez impressed, reaching base at least twice in every game. 5/2 Cup of Coffee: Monday had only two games on the docket but no shortage of strong performances. Leading the way were Trey Ball (pictured) and Roniel Raudes, who both opened May with good starts after uneven Aprils. Ball helped Portland to a shutout, while Raudes' Salem squad rallied for an extra-inning victory. The Sea Dogs made their first appearance at finally-completed Dunkin' Donuts Park and celebrated with a shutout of their cross-New England rivals. Left-hander Trey Ball had his strongest start of the season, scattering four hits over six innings, striking out six, walking two, and getting eight outs on ground balls. Jake Cosart followed, striking out the side in the seventh, but getting into trouble with three walks in the eighth. Josh Smith escaped, pitching out of the bases loaded jam. Rafael Devers homered for the third time this season, turning on a 95-mile-per-hour fastball to straightaway center field. Tzu-Wei Lin singled to extend his hitting streak to 13 games, and Nick Longhi added a double as part of the offensive effort.